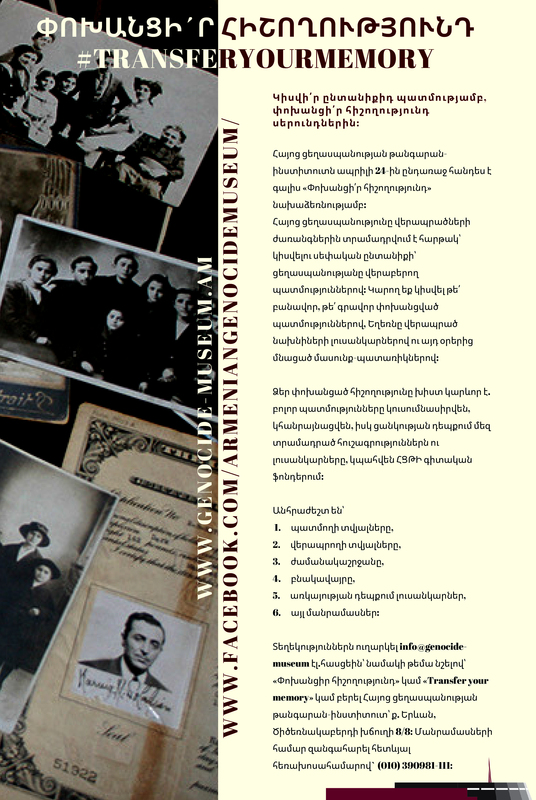 Recently the search efforts of the AGMI resulted in finding new photo documents on the Armenian genocide. 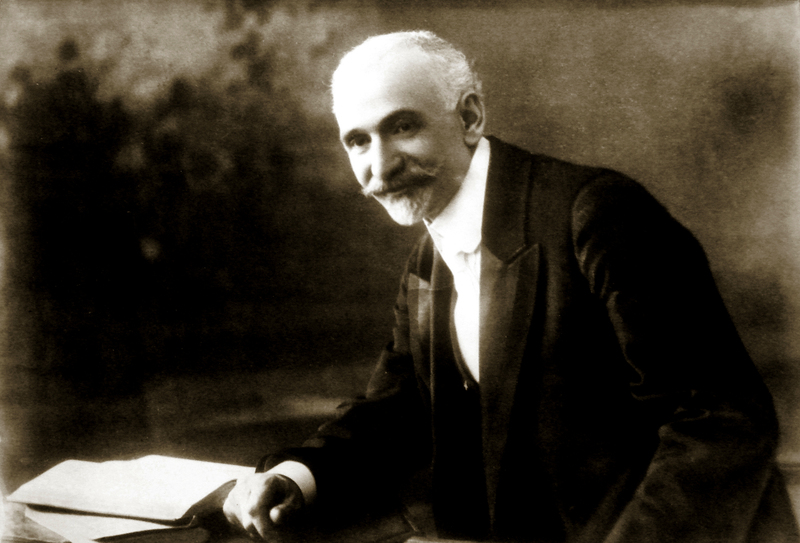 One of them was found in the handwritten memoir from the collection of the Armenian National Archives. The photo depicts a scene from the deportation camp of Ras-ul Ayn in the Syrian Desert. It is dated 1915 or 1916 and judging from the position it was taken, most probably it was taken from a hidden place or the person who took it tried to hide the very moment of taking photo. 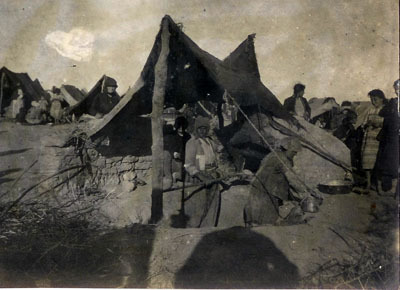 A part of the Armenian concentration camp in Ras-ul Ayn is possible to see in that photo with tents and belongings of deportees. There is an inscription on the bottom of the photo which says "A caravan of Armenian deportees at Ras ul-Ayn." The tragic fate of the Ras-ul Ayn deportees is well known. Almost all of them were massacred in 1916 making it one of the largest killing fields in Northern Syria together with Deir el-Zor, Meskene and Rakka. Another photo obtained by the AGMI shows a scene from the deportation camp in Rakka. It shows a temporary settlement of the Armenian deportees and baking spot. 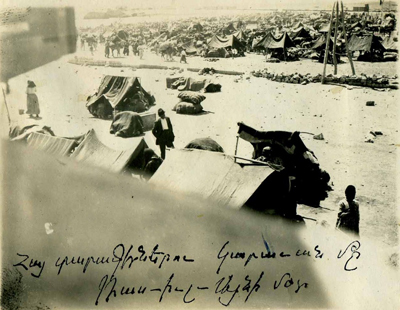 On the back side of the photo a typed text in German is attached which reads: "Armenian camp in Rakka". Most probably this photo was taken by a German military man, who was serving in the Ottoman Empire. The third one is rare stereoscopic photo showing the Armenian refugees in Mesopotamia. All photos are invaluable visual proves of the tragic fate of deported Armenian population in the deserts of Mesopotamia, making them undeniable evidence of the committed genocide against the Armenian people.